If you’ve read past the title of this article, then quite possibly you’re either considering getting into the sport of hang gliding or paragliding, have recently entered the sport or are looking to gain advanced knowledge in hang gliding. 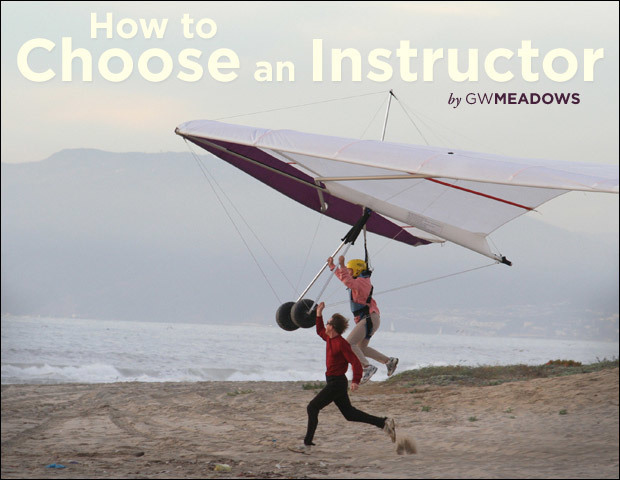 In truth, there may be no more important decision that you’ll ever make in your hang gliding or paragliding career than this: who you will enlist to teach you the sport. A good instructor will not only instill in you the basic foundation of good flying habits, but will be someone who you will be able to turn to for good advice regarding places to consider flying and equipment to consider buying for years to come. Hang gliding and paragliding are, without a doubt, one of the most rewarding sports on the planet—or rather, slightly off the planet. But if you never get to the point where you’re able to confidently launch, fly and land a hang glider, the sport will not seem so appealing to you. To help you get started, I offer here a few guidelines to follow when picking your leader as you walk down the path of personal flight. First of all, rule out the option of getting something for cheap or free. There are several things in life of which you don’t want to get the dollar-store version. Aviation training is one of those things. Any instructor who has been teaching for any amount of time knows that they have overhead that must be paid. The gliders, harnesses and helmets must be maintained and replaced at certain intervals. The site they use to teach you is probably accessed at some cost – whether by ownership, lease, work trade-out (mowing the grass) or something. Few free-flight instructional sites are available without some sort of compensation. Likewise, if the instructor himself intends to be around to teach more people in the years to come, he must be paid. He (or she) must be compensated not only for his time, but also for the wear and tear on the equipment as well as other expenses that are not obvious to the layperson. Just the cost of maintaining an instructor rating is nothing to discount in the whole scheme. To put it simply, there is no one in the hang gliding or paragliding business getting rich – trust me. Almost without exception, money you spend on your flying instruction is money well spent. Speaking of instructor ratings: Make sure that the guy or gal who is offering to help you spread your wings has that important piece of paper. It’s easy to check on it – look at the ushpa.aero Web site. If your prospective instructor isn’t certified, then move right along to someone who is. Sure, you may get all kinds of excuses as to why they are not certified, but trust me again here – there are not many good excuses for not having certification. I should point out that being certified as a USHPA instructor does not by itself make your candidate a good instructor. The USHPA’s instructor-certification program stresses safe teaching first and “good” teaching second. I was fortunate enough to be one of the folks who helped create and fine-tune the USHPA’s instructor system and I’ve had many years’ experience of running instructor-training programs. I always felt that the people going through (and graduating from) the programs were competent enough to teach safely, but there was a wide disparity in the teaching abilities of the candidates. If there’s anything I’ve learned over the years, it’s that some people were born to teach and some people weren’t. It’s a talent. There are techniques that can be taught to an instructor to help him or her become a better teacher, but being a great teacher is a lot like being a great singer. Some people are born with the ability quite naturally, but others have to work really hard just to barely earn the title. Desire alone cannot make you a good singer – or a good teacher. So now I’ve muddied the waters for you and right about now you are probably asking yourself, “How the heck am I supposed to know who the good teachers are versus the ‘not-as-good’ teachers?” The answer is actually simple: Ask. Go to where the hang glider and paraglider pilots fly and strike up some friendly conversations with them. Ask questions in general about flying – let the pilots know that you are seriously considering getting into the sport. Ask them to tell you their personal opinions of the best instructor around. Listen intently to their answers – including their mannerisms. Very often, the way someone answers that question is very telling. If they answer definitively and without hesitation, they’re probably worth listening to. If, however, they say things like, “Well, you probably would do OK if you went to So-and-So,” then make mental note of that lack of confidence. Ask several pilots in one-on-one conversations until you feel like you’re getting pointed in a general direction. Gut feeling will go a long way on this one. Let’s fast forward a little and let’s say that you’ve found someone that you’re considering taking lessons from. What should you look for when talking to him or her? No matter if your instructor candidate teaches full time or as a sideline business, they still should be professional and methodical in their demeanor. Not returning phone calls and other “non-professional” behavior isn’t a good sign for someone into whose hands you’re about to put your life. If you are lucky enough to be in an area with a well-known school that’s been around for many years, that in itself is a good sign. Very few people who do something very poorly can continue to make a living at it for very long. Bottom line: Any instructor you are considering utilizing should obviously care about taking time with you to help you make all your flying-related decisions, including taking the time necessary to answer all your questions about his or her operation. Building a good rapport between instructor and student is paramount in aviation training. The instructor should be in tune with the student as much as possible. Now, what happens if you have begun taking lessons from someone and you start to suspect that maybe they’re not your best possible choice? The answer to this dilemma is simple. For one, if you think your instructor is dangerous, then cease training with him or her until you are certain that your suspicion was incorrect. If you cannot disprove your suspicion, then move on to a different instructor – no matter what the cost. If your concern with your instructor is more along the lines of feeling that you’re not getting the best instruction you can, then try just chatting with the instructor to let him know that you want more and that he should tailor his program to fit you better. A good instructor will work with you to fit your needs whenever possible. If you are still not clicking, then consider finding another instructor. Also, where possible try to find an instructor who integrates tandem training into the training regimen. Tandem flight has proven to be one of the most effective tools for teaching hang gliding and paragliding. Tandem instruction not only allows you sufficient airtime to get the feel of a glider, it also will help to give you confidence that you can handle being at high altitude. Not all instructors can teach using tandem as their sole means of instruction, but where possible, it should be an integral part of a training program. I hope this has been helpful. With just a little investigation you can determine if the school you’re considering is the place for you to learn. Use common sense and not your bank account as the deciding factor and you’ll do well. Good luck in your flying career, and welcome to the most rewarding experience you’ll ever have. G.W. Meadows has been hang gliding for more than a quarter-century and has held every rating issued in the sport. He was on the USHPA board of directors for 15 years and was at one time president of the organization. G.W. has written or co-written much of USHPA’s tandem and training programs.